Gaining attention in the 1970s, Alaskan cruises continue to be a popular choice for travelers that seek a unique cruise experience. With a five month cruising season, beginning in May and ending in September or October, there are abundant opportunities for cruise ship workers that are also seeking a unique job experience. Alaskan cruise ships most commonly depart from Seattle, Vancouver, as well as Anchorage and Seward, Alaska. Due to easy flight access to Seattle and Vancouver, these cities have a higher volume of cruise ship departures and arrivals. In addition to jobs on large cruise ships, many opportunities exist on smaller ships. These "tour boats" take people on whale watching and glacier tours from coastal towns such as Juneau, Ketchikan, Sitka, Seward and many other towns. 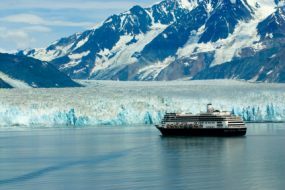 Alaskan cruises are first and foremost a vacation, but unlike island cruise ships, the Alaskan cruiser tends to be a little more interested in the nature of the destination. Expect cruisers to care less about their suntan, and more about the fact that the sun can be out for as much as 20 hours a day. These long days allow for a lot of wonderful sightseeing from on board the ship and at port. Ships will visit at least one, if not a few glacial areas. In addition, a common attraction is the wildlife - moose, caribou, grizzly bears, puffins seals, humpback and killer whales are often seen. Any Alaskan cruise ship is guaranteed to offer you an interesting work experience. Beyond that, the specific job, the size of the ship, where it departs and returns to, and what the ship's itinerary is, may be things you want to consider on your search for an Alaskan cruise ship job. Another important thing to remember is not all jobs having to do with cruising are aboard the ship, Land-based positions are needed at all cruise ship terminals to assist with arriving and departing travelers. To find out more about Alaskan cruise job opportunities, check out our Member's Section. Once a member, you will have access to the latest job openings, company profiles, and exclusive in-depth interviews with current and former cruise line employees.